Use of the givenchy.com website is subject to these General Terms and Conditions of Use of the givenchy.com website (“General Terms and Conditions of Use”). GIVENCHY may at any time modify and update these General Terms and Conditions of Use and the “Privacy and the Cookies Policies. The General Terms and Conditions of Use and the Privacy and the Cookies Policies in force at the time of use of the Givenchy.com website are those that are binding upon you. The Privacy and the Cookies Policies governs the use of personal information that you agree to communicate to GIVENCHY on this website. GIVENCHY may modify its Privacy and Cookies Policies at any time, as specified in this document. The givenchy.com website is not intended for minors. It is hereby stated that GIVENCHY is the owner of the GIVENCHY brand name and its logos. The user acknowledges the exclusive rights of GIVENCHY to the GIVENCHY brand name and shall refrain from making any use of it and more generally from infringing upon the intellectual property rights of GIVENCHY. 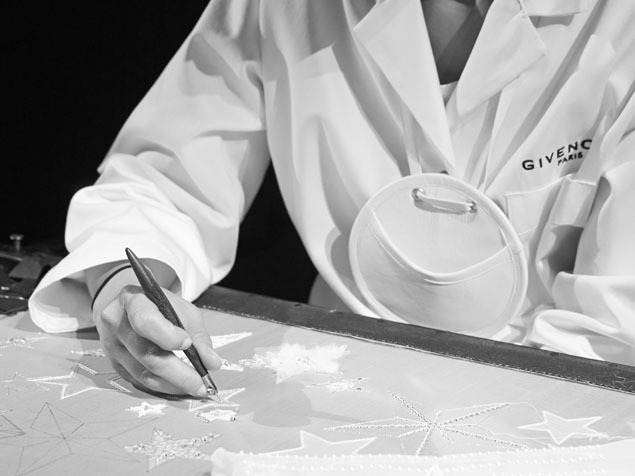 GIVENCHY reserves the right to claim damages in the event of counterfeiting and more generally of infringement upon its intellectual property rights. Similarly, the visitor shall refrain from infringing upon any property rights, particularly intellectual property rights, which may be held by any company in the group to which GIVENCHY belongs. GIVENCHY partners are owners of their brand names. Any use whatsoever of the brand names and/or logos and/or any other content is subject to the express authorization of GIVENCHY or the holder of the intellectual property rights concerned. The Website may include links to other websites or other Internet sources. As GIVENCHY is unable to control these websites and external sources, GIVENCHY may not be held responsible for the availability of these websites and external sources, and will not bear any responsibility for their content, advertising, products, services or any other information or data that is available on or from these websites or external sources. The givenchy.com website may contain technical inaccuracies or other defects, and GIVENCHY does not guarantee the correction of these defects. The givenchy.com website and the content of this site are presented “as is” and “based on availability.” GIVENCHY expressly excludes any form of guarantee, including, without limitation, any implied guarantee in respect of the general conditions of use of the givenchy.com website or the website's suitability for normal use or for a specific use, its quality, or its compliance with all legal provisions. These General Terms and Conditions of Use are governed and interpreted according to French law in accordance with EC regulation 593/2008 of 17 June 2008. In case the Visitor is a consumer the consumer protection afforded to the Visitor in the country of the Visitor’s habitual residence remains unaffected by before-mentioned choice of law. In the event of any dispute resulting from the use of the Website, you have the option of using a conventional mediation procedure or any other alternative dispute resolution procedure. No waiver of any term of these General Terms and Conditions of Use shall be deemed a further or continuing waiver of such term or any other term, and our failure to assert any right or provision under these General Terms and Conditions of Use shall not constitute a waiver of such right or provision. We advise you to keep yourself regularly informed of the current terms and conditions. You can read the current version of the General Terms and Conditions of Use at any time by clicking on the “Legal notices” link. In case of any questions, our team of advisors is available to respond in English or French, Monday through Saturday from 10:00 am to 7:00 pm (Berlin time). Contact them by calling 0800 00 1952 (toll-free number for any call made from Germany) or 00 800 0000 1952 (call charges vary according to landline rates to the location called) from abroad, or by email: contact@givenchy.com.